Oh, man — this is nuts. 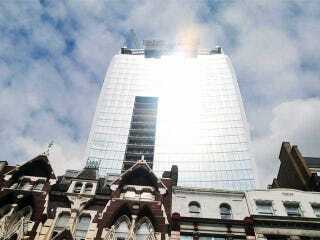 A skyscraper under construction in London is reflecting concentrated sunlight onto the streets. The beam is so hot that it's "melting cars" and popping tiles right out of the ground. For passersby, it's like standing in the glare of giant magnifying glass. Called the Walkie-Talkie building on account of its distinct shape, it's a 37-story skyscraper located at 20 Fenchchurch Street in London. But it features a unique curve that's producing an intense glare — one that's resulting in temperatures at ground level as high as 210 degrees Fahrenheit (92.6 degrees Celsius)! "I said: 'I am the owner. Crikey, that's awful.'" The wing mirror, panels and Jaguar badge had all melted, Mr Lindsay said. "You can't believe something like this would happen," he added. "They've got to do something about it. "It could be dangerous. Imagine if the sun reflected on the wrong part of the body. "On the windscreen, there was a note from the construction company saying 'your car's buckled, could you give us a call?'" According to Walkie-Talkie developers Land Securities and Canary Wharf, "The phenomenon is caused by the current elevation of the sun in the sky. It currently lasts for approximately 2 hours per day, with initial modelling suggesting that it will be present for approximately 2-3 weeks." According to a solar physicist, the solar beam could eventually shift and start to damage the nearby buildings. The construction company announced that it will erect street-level scaffolding to shield nearby businesses. But there's no word as to what they'll do to permanently fix the problem caused by the $312 million building. Perhaps surprisingly, buildings that melt you and your cars are more common than you might think.